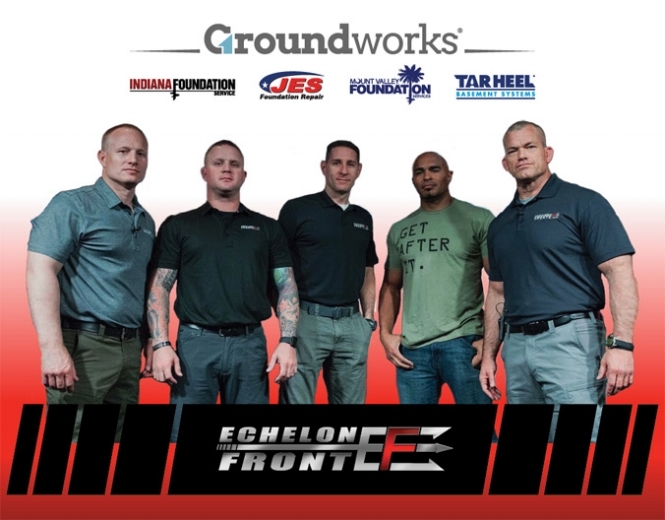 Virginia Beach, VA (June 11, 2018) – Groundworks announced today that it has entered into a multi-year partnership with Echelon Front to develop customized leadership and training programs for Groundworks and its subsidiaries. The goal of the partnership is to endow employees at all levels with the principles, skills, and resources needed to achieve the highest level of execution in all departments. Executives, managers, and frontline staff will be trained in the professional and leadership development processes of Extreme Ownership through in-person instructor-led workshops, online courses, leadership assessments, live webinars, personal consultations, and simulated battlefield training exercises. Echelon Front is owned and operated by decorated, combat-proven former Navy SEAL Officers whose leadership techniques are taken directly from their battlefield experience and applied to business and life. Co-Founders, Jocko Willink and Leif Babin, are co-authors of the #1 New York Times bestseller Extreme Ownership: How U.S. Navy Seals Lead and Win. From startups, to Fortune 500 companies, Babin and Willink have helped clients across a broad range of industries build their own high-performance teams. Groundworks’ partnership with Echelon Front will bring a new perspective and level of excellence to the training it currently provides to its staff. The Echelon Front program will include all departments from executive management, sales, production and installation, to call center operations, marketing, and administration across all brands and locations. Groundworks is the nation’s largest foundation repair company with its corporate office headquartered in Virginia Beach, VA. Groundworks is comprised of Mount Valley Foundation Services, Tar Heel Basement Systems, JES Foundation Repair, and Indiana Foundation Service. The combined companies have helped over 70,000 homeowners since 1986. Groundworks operates out of ten offices that serve South Carolina, Georgia, North Carolina, Virginia, Maryland, West Virginia, and Indiana. The company has been named to the Inc. 5000 Fastest Growing Companies, Virginia Chamber of Commerce Fantastic 50, Inside Business Roaring Twenty, and Best Places to Work. For more information about Groundworks, please visit www.Groundworkscompanies.com. Echelon Front is a premier leadership training and consulting firm owned and operated by decorated, combat-proven leaders with experience in building, training, and leading high-performance winning teams. The mission at Echelon Front is to educate and train leaders and organizations through customized training programs. The company provides unmatched solutions in leadership, strategy, innovation, management, team building, contingency planning, and crisis management developed and proven in combat. Echelon Front offers leadership development an alignment programs (LDAP), , single- or multi-day workshops, and a web-based training program through Echelon Front’s eWarfare Leadership Portal.For more information on Echelon Front visit www.echelonfront.com.